Are you a landlord who needs peace of mind that your Electrics are safe? Do you suffer frequent electrical outages in your home or business? Are you looking to replace your radiators with underfloor heating? Our family-run company is proud to serve as the Manchester and Greater Manchester areas. We’re fully qualified and insured, and offer a broad range of professional electrical services including full domestic and commercial rewiring, and under floor heating installation. We serve both homeowners and companies around Manchester, taking on jobs of all sizes – there’s no job too small for our team. 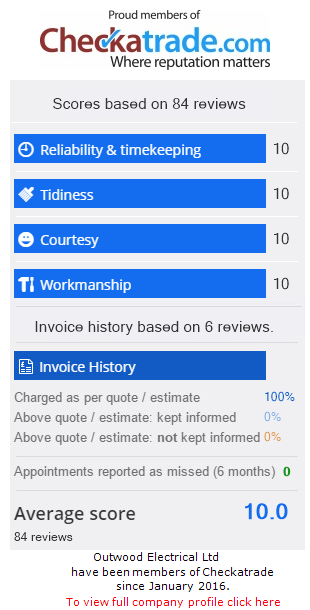 Offering free estimates and highly competitive prices, you’ll struggle to find a Manchester electrician carrying out as high a standard of customer service as Outwood Electrical. If you’d like to take a look at our extensive list of references, we urge you to get in contact with us. Likewise, call us if you’d like to have an Outwood electrician visit your home or premises today. We provide same day service and even take emergency call-outs. We’re proud to be a member of the Checkatrade quality assurance scheme, boasting a near-perfect 9.96 rating – including perfect 10 ratings in the “Reliability & Timekeeping”, “Courtesy” and “Workmanship” categories.